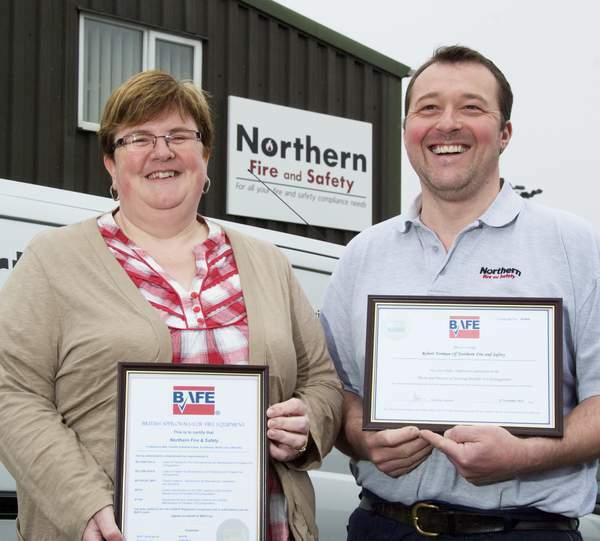 A North Lincolnshire based fire safety equipment service and maintenance specialist company, Northern Fire and Safety, has achieved BAFE (British Approvals for Fire Equipment) Registration in near record time. BAFE is the fire protection industry’s leading independent organisation dedicated to ensuring minimum standards of service delivery. Companies requiring fire extinguisher service and maintenance can ensure they meet their fire safety obligations, by employing a BAFE approved organisation with proven competency and a commitment to service excellence. Securing third party accreditation for its range of services is a considerable achievement for the company that was formed in November 2012 when Northern Fire joined forces with Fire Protection Centre Ltd in a formal merger. BAFE registration for Northern Fire and Safety as a company goes hand in hand with a commitment to employ engineers that are also BAFE registered as individuals. In a separate development the company is pleased to announce that its service engineer Rob Norman has achieved BAFE Registered Technician status. Successful applicants need to have demonstrated a wide ranging knowledge not only of the nuts and bolts of equipment maintenance but also the theory of fire risk and prevention, health and safety law, relevant British Standards and current fire and safety regulations in order to provide customers with a knowledgeable source of advice. The BAFE accreditation scheme uses standard BS EN ISO 9001:2008 as its foundation extending this established quality benchmark into the specialist field of fire safety service and maintenance. In practice this means Northern Fire and Safety undertake all work to Codes of Practice BS 5306 part 8:2012 and BS 5306 part 3:2009, ensure Fire Extinguishers are manufactured to BS EN 3 and that service documentation meets current fire safety legislation requirements. Lincolnshire Companies are some of the best in the country at approaching the issue of fire safety seriously and in a professional manner. Quality training services for such as training Fire Marshals in companies and establishments, across to having competent qualified engineers to service fire appliances. And of course at the last measure, a dedicated fire brigade. Another good reason to live in Lincolnshire. (Photo above) Zoe Bott and Rob Norman with the BAFE certificates.